More political intrigue with suspense and gutsy action in deeply researched settings. With much of the story based on fact, this is a realistic portrayal of a possible catastrophic global scenario. The terrorist Abu ben-Zhair is on the cusp of realising his vision to destroy the West and cow the East, thereby succeeding in his avowed ‘Cause of All Causes’ to establish a Caliphate which rules half the world. His earlier, unprecedented threats were ignored by the global community but he carried them out and the world was stunned. The hunt is on, with many nations in pursuit. With several major atrocities to his dubious credit, he is backed by almost unlimited funds from a Middle Eastern Sheikh. He has always delivered on his grandiose promises – and this one doesn’t come any bigger. 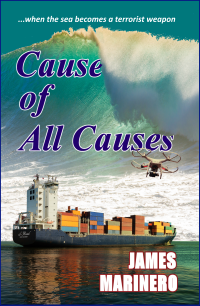 He has identified one critical point on the earth’s surface where one determined terrorist with resources and imagination can trigger disaster on a global scale – and he has acquired the weapon for this purpose. In the murky world of counter-intelligence, trust is a tradeable commodity and the turf wars continue while ben-Zhair moves towards his climactic attack. Only two people have a bead on him, despite the intensive worldwide search. Steve Baldwin - ex-Royal Marines - and Maruška Pavkovic - a psychopathic assassin and lady of many names. They are sworn enemies and both are on his trail. Will ben-Zhair cause worldwide disaster while Baldwin and Pavkovic fight their own private battles?